With your help and kind support, we offer reliable and independent information and advice. Your donation will help us to continue our vital work. Welcome to the Israel Society for Psoriasis! The site is not intended only for people who suffer from psoriasis, but is also aimed at increasing public awareness to the illness and its patients. Our site offers extensive material about the disease, methods of treatment, patient rights in Israel and information about the association. The recommendations and articles appearing on the site do not serve as an alternative for professional medical consultation. The Israel Psoriasis Association was established in the early 1970’s, by a group of volunteers with the objective of consolidating psoriasis sufferers within an association. The objectives of the organization appear in its articles of association. The Israel Psoriasis Association is managed by a group of volunteers including a chairperson, secretaries, executive council and audit committee. The Association is a member of the International Federation of Psoriasis Associations (IFPA) and it receives constant updates on the latest on psoriasis and psoriasis arthritis. The Association offers a supporting shoulder for psoriasis patients, publishes up to date information relating to psoriasis, operates in coordination with the Ministry of Health toward the recognition of patient limitations and problems, public lobbying toward the recognition of innovative and unlimited treatments, contacts with pharmaceutical companies, relations with hotels at the Dead Sea in order to obtain attractive prices and terms for Association members, contacts with the Dead Sea Local Authority, special activities for children at the Dead Sea, annual publication of the Association pamphlet, which is sent to all members and provides updated articles on psoriasis and related research. The Association operates an individual assessment committee toward helping disadvantaged members. The site provides a great deal of information in Hebrew, as well as links to additional sites. In addition, the Association publishes a newsletter that is mailed to all members of the Association, letters describing the Association’s ongoing activities and various messages. All of the material published by the Association is in Hebrew. 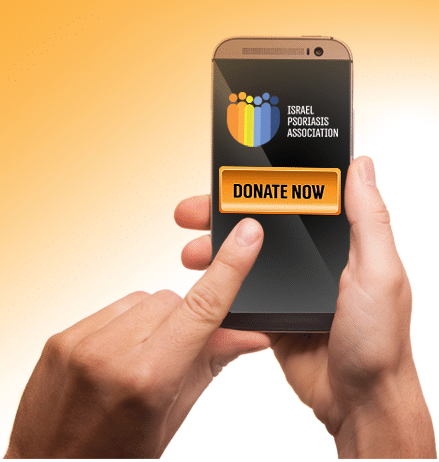 The Association will do its utmost to refer non-Hebrew speaking members to volunteers who speak the same language, in order to provide answers to their questions. Members of the Psoriasis Association are eligible to preliminary pro bono legal advice from an attorney specializing in medical issues. For more details, please contact the Association offices.